What if we get sick while in Playa del Carmen? What if we have an emergency while in Playa del Carmen? Who do we call? Which airport do we fly into? How do we get to our rental property from the airport? Why rent a condo or villa when there are many all inclusive hotel options? Playa del Carmen is typically sunny year round with lows in the mid 70s and highs in the mid 80s. For more specific details please see our weather page. We have a very good doctor who makes house calls. We even use him for our own health care. His number is located on the back of the door in your rental unit. There are also very good hospitals in Playa del Carmen and Cancun. The emergency number in Mexico for police, fire department or emergency medical services is 066. From any phone booth it�s a free call or a cell number would be 113. We encourage you to travel with travel insurance. If you have a problem that you think we can help you with please feel free to contact us. For lost documents and passports contact your consular office. Consular Agency Playa Del Carmen ("The Palapa," Calle 1 Sur, between Avenida 15 and Avenida 20, Playa Del Carmen, Quintana Roo, Mexico). The U.S. Consular Agency in Playa del Carmen is open for business Monday through Friday, from 9:00 am to 1:00 pm. Please make an appointment by calling the office phone during normal office hours or send an email to: [email protected] containing information about the service you require, your contact information and a preferred time for your appointment within normal office hours. Emergency cases are accepted as walk-ins. For a Google Map (Click Here) Note: For better results, be sure to toggle between "Map & Satellite" views at the top-right of the map. In the case of a life or death emergency involving a U.S. citizen occurring outside of normal business hours, please call the Merida switchboard number to be connected to the duty officer. Most guests fly into Cancun International Airport, 45 minutes north of Playa del Carmen. There is also an airport in Cozumel, but it would require guests to take a cab from the airport and then hop onto a ferry. The airport in Cancun is much more convenient. We offer private round trip transportation in an air conditioned van directly to your rental property for as little as $150 USD round trip. When booking your Playa del Carmen condo or villa there is an area to add on this option. Please see our airport transporation page for more details or to book now please download our airport transportation request form. Playa del Carmen is extremely safe. You find more crime in a major metropolitan US city then you do in this tranquil oasis. Most of the crime and violence in the country happens at the Mexico/US border, over 2,500 miles away from here. You are probably much closer to the violence than we are. Playa del Carmen is approximately 45 minutes south of Cancun on the Yucatan Peninsula, Mexico. One of the largest barrier reefs is located just off the shore. Playa del Carmen is known for its white sand beaches, warm turquoise waters and Mayan ruins. You could live here for 10 years and still not participate in many of the activities and attractions. There is a myriad of diverse restaurants. For the adventurous traveler there is world class snorkeling and scuba diving, cave diving and zip lines. Kids love the beaches and swimming with dolphins. Culture seekers will love the Maya archeological site Chichten Itza, one of the New Seven Wonders of the World. For a full list of activities please check out our local area guide. Most who stay at an all inclusive hotel rarely leave the complex other than to maybe take a stroll down our pedestrian boulevard, 5th Avenue. Guests at all inclusives feed on stale buffets and watered down Margaritas. 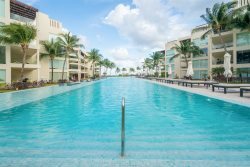 A rental of a condo or villa offers you the opportunity to interact with the local culture, try the local restaurants, to really get a feel of the magic of Playa del Carmen. Should you have more questions or concerns please feel free to contact us.